Fireside Lodge Opening we had a mix of very warm temperatures for 5 days but the got multiple cold fronts with a lot of rain. The fishing proved to follow the weather patterns but all in all guests caught a lot of nice fish, as the pictures below will show. Greg & Don Foley from Crownsville & Pasadena, MD were first to arrive in 2016. Here for their 6th consecutive year it showed by them catching 17 Northern Pike, 6 Smallmouth Bass the 1st day seeing tons of other fish. 2nd day was 16 Pike to 34�?� & 16 Smallmouth Greg landing 3 trophies. 3rd day was even better producing 31 Pike & 13 Smallmouth Don landing 2 trophy bass & Greg got his 4th. 4th day they had a triple crown by breakfast and in the daytime a grand slam catching SB, NP, Muskie, & LT. They did a lot of exploring & said if the caught half the big fish they found it would be a banner day. Last day the caught 27 Pike up to 36�?� & 3 Muskie at 36, 38.5, & 42 inches concluding another fabulous father & son fishing trip. Mike Uebelherr from Stow, OH returned for his 13th trip. Fishing by yourself is a challenge, Mike doing a great job hooking, landing, taking a photo, & releasing fish. Fishing for all toothy critters he caught many Northern Pike and some Muskie. Many Northern Pike were over 30�?� up to 36�?� & his tree Muskie toped off with a bug 38.5�?� beauty. Mike left having a great trip hoping to return this September. Long time return guest since 1993, Dave Young from Nashville, TN with good friend Frank Wilich from Bethlehem, NH. 1st day they caught some nice Pike & Frank had three follows from trophy size Fish. 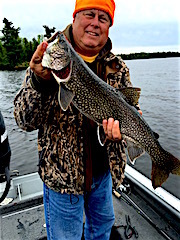 2nd day was a big day for Pike catching numbers & big fish plus each caught a big Lake Trout. 3rd day they expressed that had a great day catching big Northern Pike 7 2 more Huge Lakers. 4th day was numbers of medium size pike and 2 more BIG Lake Trout. Last half day was good fishing but had to get off the water by noon for and depart at 2 so Frank could make his flight home. Both had a fabulous time and reserved another week later this year. Long time return guests Bryan Nell III & Tim Stewart from Rochester, MN were back for their 14th consecutive year & more than 20 trips. In their 5 days of fishing these two caught 100�? ?s of fish, most were Northern Pike between 30-36�?�, Bryan lading a 38.5�?� and Tim with a 40.5 Trophy. They caught some nice Smallmouth Bass a few Muskie & about 11 Lake Trout with both Tim & Bryan catching 32�?� Lakers that had a Huge Girth. These fish were caught trolling and casting which is how the biggest Pike were caught. Flexibility is the key as one tougher day hey started searching for a lure that would work in an area they knew held Pike. Well after some time Tim found the magic lure, a gold spoon. Both left looking forward to their return in August. Multiple year return guest David Bone, Woodland Park, CO, son Jeff, El Reno, OK, and Mark Forsyth, AZ were trilled to be back. 1st day they got right to it catching many big Smallmouth Bass & a half dozen Pike. The big catch of the day was when the came across a very large wolf swimming across the lake. They were able to get up close pictures and a 4-minute video of this special event. 2nd day they hunted Big toothy critters seeing plenty but unable to land one. 3rd day was a miserable Easterly rainy/cold front and the fishing showed it as they squeaked out a few fish. 4th & final day the weather still played a role but all persevered, catching a mix of Pike & Smallmouth. Long time guests Larry & Diane Siebenthal from Creve Coeur, IL were thrilled to be back. 1st day was a good number day for Pike landing 28 plus Diane caught a 34�?� Muskie, but the biggest catch was Diane getting great photos of a Cow Moose showing her new born calf it�? ?s way. 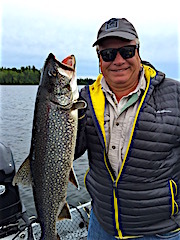 Next day had them doing well on Pike & Larry was surprised by a HUGRE Lake Trout. Fighting off a cold front with a lot of rain they still managed 17 Pike between 30-36�?� and Larry nailed a HUGE 43�?� Muskie with massive girth. The rest of their stay they caught between 15-22 pike per day and a few more Muskie despite having several cold frons and rainstorms during that time. Both left having had a wonderful stay & were already planning their return trip. 14 Year guest Ken Beta from Fox Lake, IL returned with his wife Sandra & good friends Scott DuBois & Nancy Beguhn from Pleasant Prairie, WI for their 2nd year. 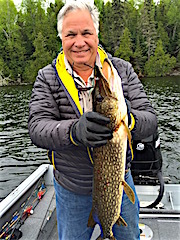 1st day they caught a mix of Northern Pike & Bass Ken landing a 19�?� Master Anglers Award Smallmouth & Sandra tied into a Trophy Northern Pike, which she could not manage to land as it broke her line on the 7th run. Next day was Nancy�? ?s turn losing a Pike too large for the net. Remaining several days the caught a mix of Smallmouth Bass & Pike, Sandy having the hot hand, & Nancy continuously worked at improving her technique plus we celebrated her birthday in our dinning room. Every evening after supper they played card games having plenty of laughs and endless conversation. All left having an enjoyable stay making many memories. David & Molly Wellard from Johannesburg, South Africa currently living in Pittsburgh along with Molly�? ?s sister Hazel from Johannesburg, South, Africa included Fireside Lodge on their 4 week US / Canadian tour & we were thrilled they did. Fishing was not their purpose, but visiting us to take in our wonderful wilderness atmosphere, wildlife, and beautiful accommodations was exactly what they needed after 3 weeks of travel through the western US & Canada. They had a wonderful stay with being in awe of all we have to offer, and have all intentions of returning in the near future.